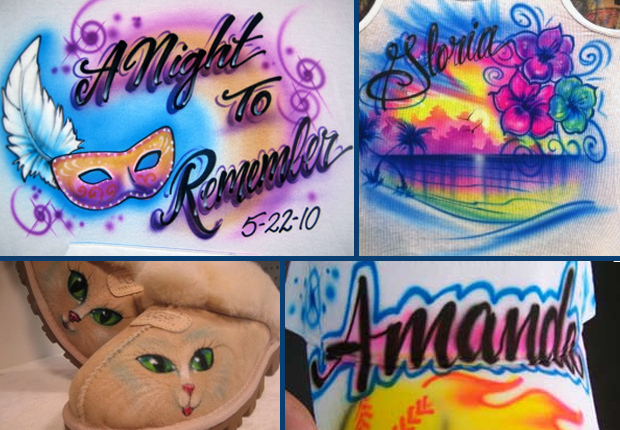 Our incredible Professional Airbrush Artists are some of the best in the business and perfect for your next event. This makes an amazing party favor and a great way to entertain guests too. 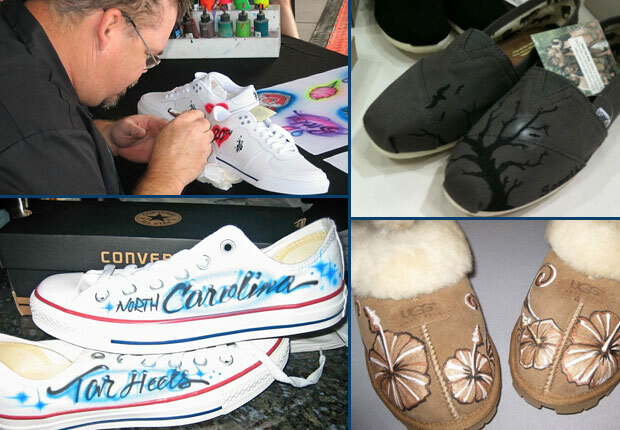 We can airbrush T-Shirts, Hats, Suede Boots, Canvas Tote Bags, Jackets and Much More. Your guests can customize their party favors right at your event in minutes. We don’t use standard cookie-cutter templates! What age guests enjoy this ? Is the paint safe ? We ONLY use nontoxic specialty paint made for garments and this purpose. Since the paint is sprayed through the airbrush using air and the paint layer is very very thin, it dries fully almost instantly! Does the design wash off ? This is permanent garment paint. It will last many years. To prevent some natural occurring fading, you can iron the garment inside out to heat-set the paint, but it’s not necessary. How long do the designs take ? Depending on how detailed the designs we are requested to paint. It can take only between 2 to 6 minutes each. If more elaborate work is requested, it may take a smidge more time. Is this messy at the location ? We take every precaution to have a very clean work environment. We used drop clothes,aprons and table clothes and leave the location as clean as when we arrived. The airbrush is very accurate, so for our expert air brushers, there is no over spray that goes anywhere but where they choose it to spray. What type of garments can you paint on? We recommend Cotton T-Shirts, Trucker Hats, Boxers or anything else you can think of that will hold the acrylic paint.